Mandiferous' Blog | FeedTacoma.com | Tacoma blogs, events calendar, news, restaurants, photos, discussion, videos, and more! Pierce County YWCA is hosting a Glam That Gives Pre-Shopping event today until 3pm and tomorrow from noon-4pm. Shop new and gently worn fancy gowns, shoes and purses. All proceeds benefit the YWCA's programs. Prom is just around the corner and most of these dresses are in the $25-$75 range. The shoes (many of them brand new) are $30 a pair or less. Tuesday was my 29th birthday. I spent most of the day at a conference in Mukilteo so I didn't make it back to Tacoma in time for dinner. Last night my parents took me to a new restaurant in Tacoma: Marrow Kitchen Bar on 6th Ave. Their soft opening was July 30th so it hasn't been open long but the initial reviews have been very positive. Thought I'd check it out for myself. First off, I love the decor. Lots of IKEA furniture, but classy IKEA, not MTV Real World IKEA if you know what I mean. Owner Jason Jones built the clustered bare bulb light fixtures. I couldn't stop staring. 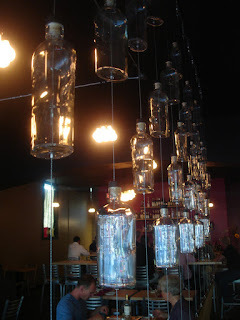 Lots of mirrors and cork along the walls, as well as a neat "wall" of glass whiskey bottles on wires. I arrived much earlier than my parents and treated myself to a cocktail. Just about all their cocktails are named after women: Betty, Wilma, Ophelia, etc. I had a Betty. I don't remember all the ingredients but it tasted like orange and deliciousness. Behold the Betty. I had two. I was also brought bread and butter to snack on. I believe it was potato bread. Nothing super special but the butter was sprinkled with black sea salt, which I'd never had before. Each time I bit into a grain of salt it was a little explosion of flavor that complemented the butter really well. My parents arrived and we tackled the menu. It was pinned to a sheet of cork board (another fun touch but I didn't get a pic). One side (Marrow) featured all the meat-centric dishes, the other (Arrow) was all vegetarian entrees. We started with the spicy onion ale soup. The spicyness of the fennel was a little much for me but for the most part I really enjoyed it. All three of us opted for the Marrow menu. My mom ordered the duck with broccolini and a potato puree. The plate was finished with a pistachio dust which was a festive touch but didn't really affect the dish flavor-wise. That's a russet chip sticking out of the potatoes. I'm not a big fan of duck, but that was probably the best I've ever had. The broccolini was al dente with a great crunch. The potatoes were pretty mild, but worked very well to balance out the richness of the duck. My dad ordered the 8oz ribeye with wild mushrooms, potato puree and some sort of greens (spinach?) on top. The steak was a little lightly seasoned for my taste but was incredibly tender. Having a lap band, I often can't eat steak because it's too dense. I didn't have any problem with this. I ordered the escargot. I'd never had snails before but had always been curious. Ho. Lee. Crap. It was amazing. Soft and chewy but not at all rubbery, with a rich (I hesitate to say "earthy" for fear of sounding pretentious but that's the word that came to mind) flavor. Cooked with chunks of bacon in a garlic and basil butter sauce with a little lemon zest for a nice citrus-y bite. I swear I spent half my meal with my eyes closed, it was that good. The bacon itself was pretty rubbery when you chewed on it, but the infusion of flavor was incredible. The bread was a nice touch for soaking up the leftover butter. The frisee with a balsamic vinaigrette was meh. I suppose the acidity of the vinaigrette was supposed to balance out the richness of the escargot but I was enjoying the snails and butter too much to care. See that bowl on the left. It's full of magic. Magic and butter and bacon. I think the serving sizes were just right for the varying richness of the dishes. The three of us had just enough room to split a dessert. There were only three dessert choices and we opted for the poached pear with fresh berries and hazelnut mascarpone. The pear was poached in cinnamon, cloves and probably some sort of simple syrup. I'm not normally one for fruity desserts but this was pretty damn good. Like extra-firm cinnamon applesauce. The mascarpone had chunks of hazelnuts mixed in which added an unexpected but tasty crunch. A sliced strawberry and a couple raspberries finished the dish off nicely. I left Marrow wanting to have its babies. Will definitely come back and explore the vegetarian side of the menu soon. Here are a couple more pics just for fun. My water came with cucumber. I would have preferred ice but it was a cute touch. One of the art installations. Like coasters on steroids, but I kinda dug it. Art raffle and live painting. All proceeds go to paying for Urban Art Festival. In the last few days I've read a lot of inaccurate info about the Tacoma Urban Art Festival. One reporter was vague and listed the wrong website. Another writer falsely reported that the festival wasn't even happening this year. The Tacoma Urban Art Festival IS happening this year. Saturday, August 1st, 11am-9pm (ish). We've relocated to Jefferson Street, outside the Swiss Pub. Since Hot Rod a Rama isn't happening this year, we've partnered with the Lifters car club and will be having a pre-1973 car show in the parking lot across from the Swiss (we're going for an "Iron vs Art" theme). The music stage and live glassblowing will also be in the parking lot. Up on the street, from Rock Pasta to the Swiss, there will be vendors of all kinds. True, it's not quite the same crew running the festival this year. Matt and Laura Eklund are working on their own projects, and Linda Honeck is preparing for an upcoming move to Cali. However, Johanna Gardener, Lisa Fruichantie, and myself are still chugging along, trying to eke at least one more year out of the festival. I've noticed that I haven't been receiving mail on Saturdays lately. I remember reading a while back that the post office was considering cutting mail delivery down to five days a week, but I didn't hear whether it actually happened. Is my mail carrier just lazy, or are they only delivering in Tacoma Monday thru Friday now? Thanks to those of you that attended our last Interact. Off the top of my head, I remember seeing droid, Frinklin, and jcbetty at the event. Our next open house is focused on getting out and doing something with the family. Highlighted websites include Hands On Children's Museum, Imagine Children's Museum, Children's Museum of Tacoma, KidsQuest Children's Museum, Metro Parks, Northwest Trek, Point Defiance Zoo and Aquarium, and Airstream travel trailers. For those that want to bring their whole family, Hands On Children's Museum will be providing activities for the little ones. For the grown-ups, there will be refreshments, stimulating conversation, door prizes, and goody bags with 2 for 1 admission to some of the museums, as well as other swag. If you're interested in attending, please complete the Interact RSVP form and let me know if you're bringing any children with you. The event is Wednesday, March 4th from 3:30-6pm at the SiteCrafting offices: 2725 Pacific Ave. Suite 100. Several members of the SiteCrafting team are regular (or semi-regular) contributors to Feed Tacoma. Ever wonder what we do when we're not adding our 2 cents to the blogosphere? Here's your chance. Wednesday, February 4th, we're having an open house to showcase some of our sites. The theme for February is food and drink so we'll be featuring the recently launched SouthSoundEats.com, as well as sites for Primo Grill and CrownBar. "Stop by to sample wine recommended by Kris Blondin of Vin Grotto and the favorite beers of Phillip �Knuckles� Hamilton. Try recipes from the Twin Tastes blog, and indulge in appetizers from Primo Grill and CrownBar. The Interact is a monthly open house and showcase featuring some of SiteCrafting�s recently launched websites. As we're not scheduling any formal presentations, stations will be set up where you can view highlights of some of this year's launched sites and meet the developers and clients behind those sites. To register for the next event, please complete our Interact RSVP Form at www.sitecrafting.com/interact. The event will take place from 3:30-6pm and we ask that attendees be over 21. Born as a jack of all trades web service ten years ago, SiteCrafting has grown to be one of the largest and fastest growing web development companies in the South Sound. Specializing in custom web solutions, SiteCrafting also offers Search Engine Optimization assistance and provides a 100% uptime guarantee on all of its website hosting. For more information, please visit www.sitecrafting.com."